Motocross is a thrilling, off-road motorcycle racing sport that’s quickly gaining in popularity. 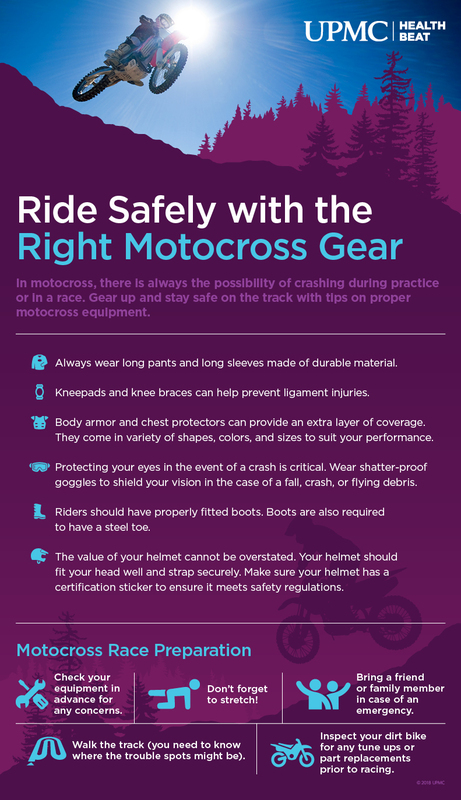 Because motocross accidents, falls, and collisions occur often, it’s important for riders to have proper, well-fitted safety equipment that is suited to their age, experience, and level of competition. Connect with UPMC Sports Medicine online or by calling 1-855-93-SPORT (77678). In motocross, there is always the possibility of crashing during practice or in a race. Wearing the proper gear can soften the impact of a fall or crash, leading to a less severe injury. Always wear long pants and long sleeves made of durable material. Kneepads and knee braces can help prevent ligament injuries. Body armor and chest protectors can provide an extra layer of coverage. They come in a variety of shapes, colors, and sizes to suit your performance level. Protecting your eyes in the event of a crash is critical. Wear shatterproof goggles to shield your eyes during a fall, crash, or flying debris. Boots that fit properly are an important part of staying safe and avoiding common motocross injuries. If your boots are too big, it can be difficult to control the bike. And boots must have a steel toe to comply with safety requirements. Most importantly, the value of wearing a helmet cannot be overstated. Your helmet should fit your head well and strap securely. Make sure your helmet has a certification sticker to ensure it meets safety regulations. Crashing your bike is a part of motocross. If you do crash, you should not attempt to restart your bike in the middle of the track. The safest thing to do is to move yourself and your bike out of the way of other riders, if you can. If you are seriously injured, you should stay in place and wait for help. If you and your team have a signal for assistance, try to give it as soon as possible.